Operation Flavius (also referred to as the “Gibraltar killings“) was a controversial military operation in which three members of the Provisional Irish Republican Army (IRA) were shot dead by the British Special Air Service (SAS) in Gibraltar on 6 March 1988. The three—Seán Savage, Daniel McCann, and Mairéad Farrell—were believed to be mounting a bombing attack on British military personnel in Gibraltar. SAS soldiers challenged them in the forecourt of a petrol station, then opened fire, killing them. All three were found to be unarmed, and no bomb was discovered in Savage’s car, leading to accusations that the British government had conspired to murder them. An inquest in Gibraltar ruled that the SAS had acted lawfully, while the European Court of Human Rights held that, although there had been no conspiracy, the planning and control of the operation was so flawed as to make the use of lethal force almost inevitable. The deaths were the first in a chain of violent events in a fourteen-day period; they were followed by the Milltown Cemetery attack and the corporals killings in Belfast. The Milltown Cemetery attack (also known as the Milltown Cemetery killings or Milltown Massacretook place on 16 March 1988 in Belfast‘s Milltown Cemetery. During the funeral of three Provisional IRA volunteers killed in Gibraltar, an Ulster Defence Association (UDA) volunteer, Michael Stone, attacked the mourners with hand grenades and pistols. As Stone ran towards the nearby motorway, a large crowd began chasing him and he continued shooting and throwing grenades. Some of them caught him and began beating him, but he was rescued by the police and arrested. Three people had been killed and more than 60 wounded. The “unprecedented, one-man attack” was filmed by television news crews and caused shock around the world. Three days later, at the funeral of one of Stone’s victims, two non-uniformed British soldiers drove into the funeral procession. Bystanders, who reportedly thought it was a replay of an attack like that carried out by Stone, dragged the soldiers from their car; the two corporals were later shot dead by the IRA. British Army corporals David Howes and Derek Wood were killed by the Provisional IRA on 19 March 1988 in Belfast, Northern Ireland, in an event which became knowns as the corporals killings. The plain-clothes soldiers were killed after driving a car into the funeral procession of an IRA member. The views and opinions expressed in this post / documentary are soley intended to educate and provide background information to those interested in the Troubles of Northern Ireland. Corporal Derek Wood was killed at the IRA funeral of Kevin Brady in Andersonstown in 1988..
British Army corporals David Howes and Derek Wood were killed by the Provisional IRA on 19 March 1988 in Belfast, Northern Ireland, in an event which became known as the corporals killings. Corporal David Howes was killed at the IRA funeral of Kevin Brady in Andersonstown in 1988. “For a ghastly half-hour the mask slipped. The real face of IRA violence was shown. 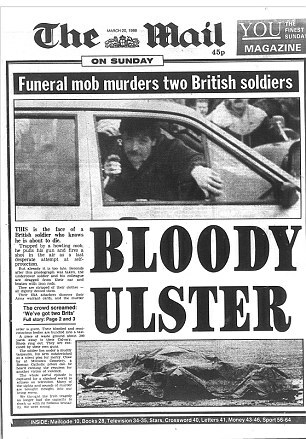 The plain-clothes soldiers were killed after driving a car into the funeral procession of an IRA member. Three days before, loyalist Michael Stone had attacked an IRA funeral and killed three people. Believing the soldiers were loyalists intent on repeating Stone’s attack, dozens of people surrounded and attacked their car. During this, Corporal Wood drew his service pistol and fired a shot in the air. The soldiers were then dragged from the car, beaten, and taken to nearby waste ground where they were stripped and shot dead. 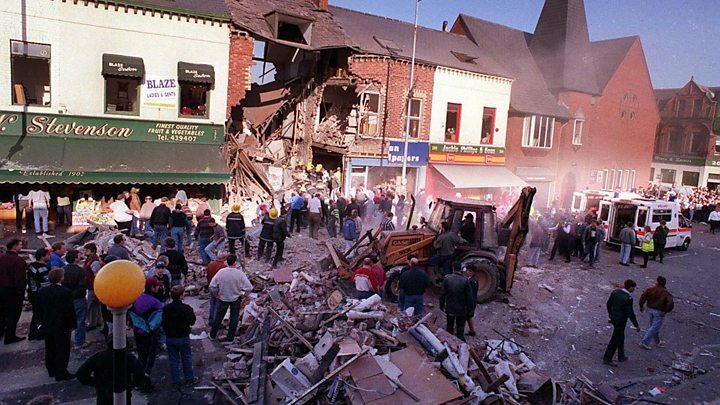 The incident was filmed by television cameras and the images have been described as some of the “most dramatic and harrowing” of the conflict in Northern Ireland. The killings took place against a backdrop of violence at high-profile Irish republican funerals. 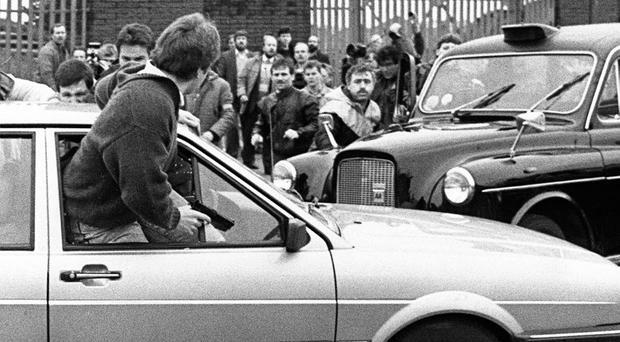 A heavy security presence was criticized as instigating unrest, leading authorities to adopt a “hands off” policy with respect to policing IRA funerals. 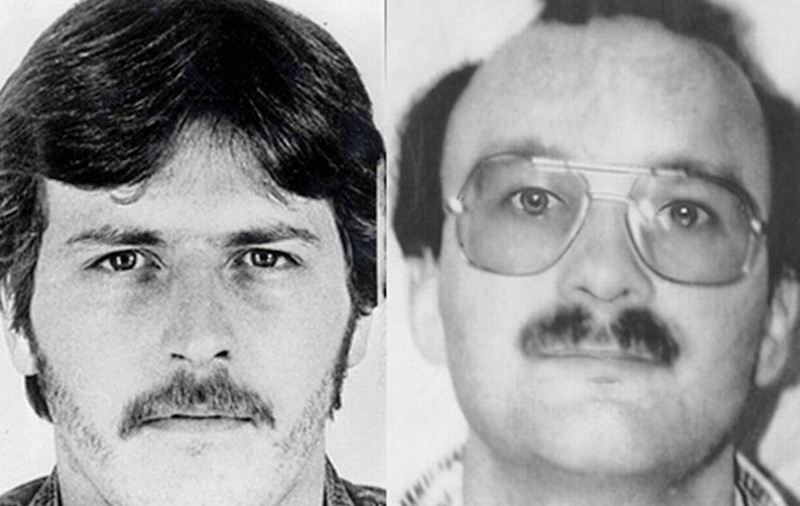 On 6 March 1988, three unarmed IRA members preparing for a bomb attack on the band of the Royal Anglian Regiment were killed by members of the Special Air Service (SAS) in Gibraltar during Operation Flavius. Their unpoliced funerals in Belfast’s Milltown Cemetery on 16 March were attacked by Ulster Defence Association (UDA) member Michael Stone with pistols and hand grenades, in what became known as the Milltown Cemetery attack. Three people were killed and more than 60 wounded, one of the dead being IRA member Caoimhín Mac Brádaigh (Kevin Brady). 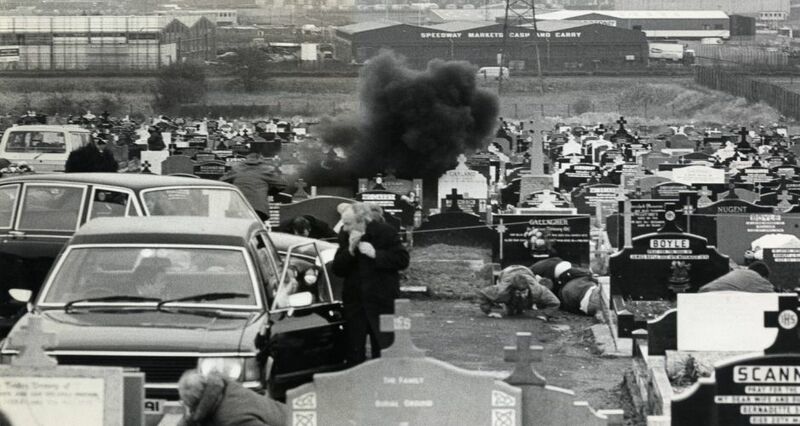 Mac Brádaigh’s funeral, just three days after Stone’s attack, took place amid an extremely fearful and tense atmosphere, those attending being in trepidation of another loyalist attack. The attendance at the funeral included large numbers of IRA members who acted as stewards. David Robert Howes (23) and Derek Tony Wood (24) were corporals in the British Army’s Royal Corps of Signals. According to the British Army, Howes and Wood ignored general orders to stay away from IRA funeral processions. It has been presumed that the two men drove into the procession by accident. David Howes and Derek Wood were wearing civilian clothes and driving in a silver Volkswagen Passat hatchback. The Mac Brádaigh funeral was making its way along the Andersonstown Road towards Milltown Cemetery when the car containing the two corporals appeared. The car headed straight towards the front of the funeral, which was headed by several black taxis. It drove past a Sinn Féin steward who signalled it to turn. Mourners at the funeral said they believed they were under attack from Ulster loyalists. The car then mounted a pavement, scattering mourners, and turned into a small side road. When this road was blocked, it then reversed at speed, ending up within the funeral cortege. When the driver attempted to extricate the car from the cortege his exit route was blocked by a black taxi. When the car was surrounded and the windows smashed, those surrounding attempted to drag the soldiers out. Wood produced a handgun, which certain off-duty members of the security forces were permitted to carry at the time. Wood climbed part of the way out of a window, firing a shot in the air which briefly scattered the crowd. Television pictures showed the crowd surging back, with some of them attacking the vehicle with a wheel-brace and a stepladder snatched from a photographer. The corporals were eventually pulled from the car and punched and kicked to the ground. They were dragged to the nearby Casement Park sports ground. Here they were again beaten and stripped to their underpants and socks by a small group of men. According to the BBC and The Independent the men were also tortured. A search revealed that the men were British Army soldiers. Redemptorist priest Father Alec Reid, who later played a significant part in the peace process leading to the 1998 Good Friday Agreement, intervened and attempted to get someone to call for an ambulance, but was dragged away and threatened with shooting if he did not stand up; he was then pulled away from the men. The corporals were further beaten and thrown over a high wall to be put into a waiting black taxi. It was driven off at speed, while camera crews captured one of its passengers waving a fist in the air. 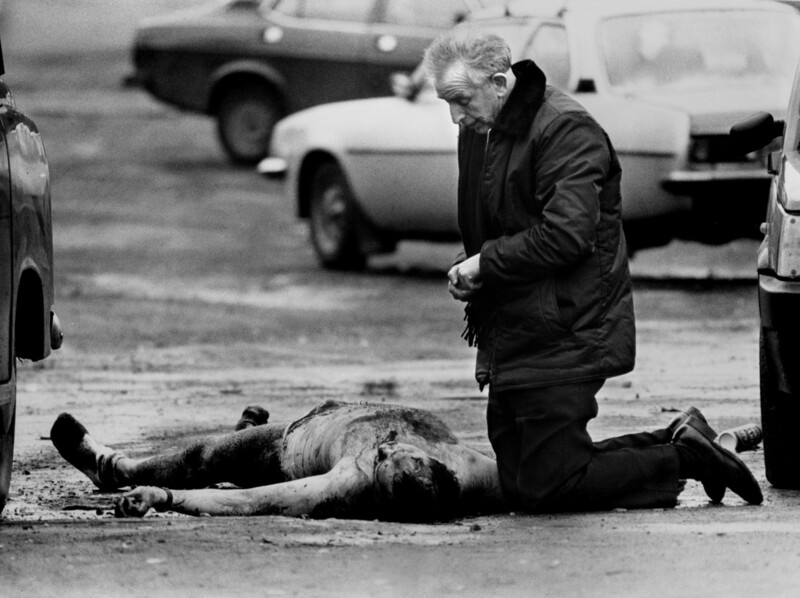 According to photographer David Cairns, although photographers were having their films taken by the IRA, he was able to keep his by quickly leaving the area after taking a photograph of Reid kneeling beside the almost naked body of Howes, administering the last rites. Cairns’ photograph was later named one of the best pictures of the past 50 years by Life magazine. The Belfast brigade, IRA, claims responsibility for the execution of two SAS members who launched an attack on the funeral cortege of our comrade volunteer Kevin Brady. The SAS unit was initially apprehended by the people lining the route in the belief that armed loyalists were attacking them and they were removed from the immediate vicinity. Our volunteers forcibly removed the two men from the crowd and, after clearly ascertaining their identities from equipment and documentation, we executed them. “an act of appalling savagery”. Two men, Alex Murphy and Harry Maguire, were found guilty of the murder of the corporals. They were jailed for life in 1989, with a recommendation of a minimum 25 years. Murphy received a further 83 years, and Maguire 79 years, for bodily harm, falsely imprisoning the soldiers, and possessing a gun and ammunition. Both men had been listed as senior members of the IRA’s Belfast Brigade. In 1973, at the age of 15, Murphy had been the youngest republican internee in Long Kesh prison, which later became known as the Maze. Maguire became a member of the IRA’s “camp staff” in the Maze, one of the senior IRA men effectively in control of the republican wings, and met Northern Ireland Secretary Mo Mowlam when she visited the jail to negotiate with prisoners. In November 1998, Murphy and Maguire were released from the Maze prison as part of the early prisoner release scheme under the Good Friday Agreement. Maguire is now chairman of the Belfast office of Community Restorative Justice Ireland, a police-supported group aimed at dealing with low-level crime through mediation and intended to replace the practice of “punishment beatings” and kneecappings by paramilitaries. A further three men were in 1990 found guilty by common purpose of aiding and abetting the murder. The men (Pat Kane, Mickey Timmons, and Seán Ó Ceallaigh) were dubbed the “Casement Three” by republicans who disputed the validity of their convictions. Kane’s conviction was quashed on appeal due to the unreliability of his confession. Ó Ceallaigh was released in 1998 under the Good Friday Agreement. Terence Clarke, the chief steward on the day, was sentenced to seven years’ imprisonment for assaulting Corporal Wood. 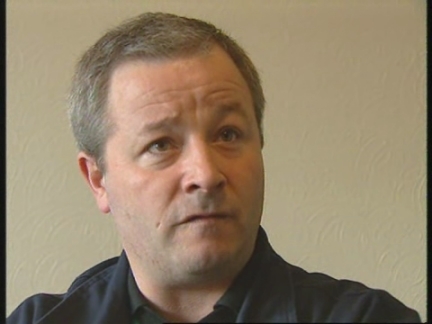 Clarke had served as Gerry Adams‘ bodyguard; he died of cancer in 2000. Stone was born in Harborne, Birmingham, to English parents Cyril Alfred Stone and his wife Mary Bridget (née O’Sullivan). Mary Bridget walked out on the marriage soon after Stone’s birth and Cyril Alfred enlisted in the Merchant Navy, leaving the infant Michael in the care of John Gregg and his wife Margaret (Cyril’s sister) who lived in Ballyhalbert. 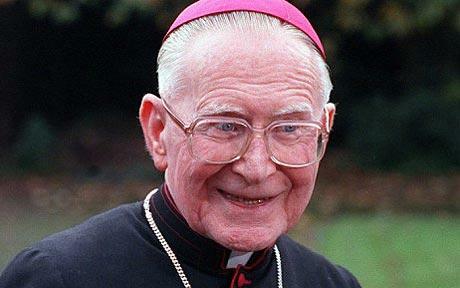 Stone has claimed that he suspects his biological mother may have been a Catholic because of her name but added that he was baptised in the Church of Ireland by the Greggs and as such he has always self-identified as Protestant. Cyril Stone subsequently remarried and had two children, Michael Stone’s half-siblings, by his second wife – Tracey and Terence – the latter of whom converted to Buddhism and became a monk in Southeast Asia. The Greggs had five biological children with whom Stone was raised and whom he identifies as siblings, a son John and four daughters, Rosemary, Colleen, Sharon and Shirley. The Greggs moved to the Braniel estate on the outskirts of Belfast in 1959 due to John Gregg securing employment with Harland and Wolff shipyard. Stone attended Braniel Primary School and Lisnasharragh Secondary School, where fellow pupils included George Best, who was in the same class as Stone’s sister Rosemary Gregg. Stone enrolled in the Army Cadet Force as a fourteen-year-old where he received basic training in firearm use. Stone was expelled from school at fifteen and a half after a series of playground fights and left Lisnasharragh with no formal qualifications. He would find work as a “hammer boy” in the shipyard only a few weeks later. However he got into a fight with another worker and, following a suspension, resigned his position. In 1970 Stone helped establish a Braniel street gang, which called itself the Hole in the Wall Gang, and which Stone claims included Catholic and Protestant members. Gang members, who adopted a form of uniform consisting of blue jeans and oxblood Dr. Martens and who carried knives, clashed regularly with members of other Braniel gangs as well as those from neighbouring estates in east Belfast. In 1971 Stone joined a “Tartan Gang” that had started up on the Braniel estate and he was soon recognised as “general” of this loyalist group. The gangs were responsible for sectarian violence, which usually took the form of spending Saturday afternoons in Belfast city centre attacking Catholic youths, and vandalising the Catholic repository in Chapel Lane. Stone met Tommy Herron, commander of the Ulster Defence Association‘s East Belfast Brigade, when Herron moved into the Braniel estate in 1972. According to Stone, Herron took him and three friends to the neighbouring Castlereagh Hills one day and brought a German shepherd dog with them. After the four had played with the dog for around half-an-hour, Herron produced a gun and told them to kill the dog. After his three friends refused Stone shot the animal and was praised by Herron for being ruthless. He was sworn in as a member of the UDA at a ceremony the following week. Stone was trained in weapon use by Herron himself for several months and according to Stone at one point in the training Herron shot him with a blank round from a shotgun. Stone’s early UDA activity was mostly confined to stealing and in 1972 he was sent to prison for six months for stealing guns and ammunition from a Comber sports shop. He returned to jail soon after his release for stealing a car. Tommy Herron was murdered, probably by colleagues, soon afterwards and the Braniel UDA went into abeyance. Following Herron’s death, Stone withdrew from the UDA and in January 1974 attached himself to the Red Hand Commando (RHC), a loyalist group that also operated a Braniel unit under Sammy Cinnamond. According to Stone, one of his earliest duties was acting as a bodyguard to Vanguard Unionist Progressive Party leader Bill Craig. In 1978 the UDA encouraged Stone to join the Royal Irish Regiment at Ballymena in order that he could receive training with anti-tank weaponry although he did not receive this training and left after six months. According to Martin Dillon, Stone also held membership of Tara, an anti-Catholic and anti-communist organisation led by William McGrath, a close associate of RHC leader John McKeague. Dillon also argues that Stone had actually joined the RHC at an earlier date and held simultaneous membership of the other groups, Tara and the UDA. Cross-membership of more than one loyalist group was not unheard of in the early days of the Troubles. Stone became close to John Bingham, the commander of the Ballysillan Ulster Volunteer Force (UVF, which the RHC was very close to), and the two worked closely on a fund-raising drive for their groups. According to Stone this included a meeting with two members of Mossad who wished to provide funding to the UVF. Stone however was eager to become more closely involved in killing and under Cinnamond that was not on the agenda so he drifted from the RHC. In 1984 Stone decided to reactivate his membership of the UDA and contacted Andy Tyrie to receive permission. After a brief period with the near moribund Mid-Ulster Brigade, Stone, who felt he was too well known in east Belfast to rejoin the local brigade, met John McMichael and was soon seconded to his South Belfast Brigade. McMichael soon provided Stone with guns and placed him in a team whose ostensible purpose was to fill McMichael’s hit list, a list of high-profile Irish republican targets the Brigadier wanted killed. His first target was Owen Carron, who actually was a high-profile republican. Stone trailed Carron for several weeks but on the day he was due to kill the Sinn Féin activist, Stone was tipped off that the Royal Ulster Constabulary knew about the plan and were approaching, so the hit was abandoned. On 16 November 1984 Stone committed his first murder when he shot and killed Catholic milkman Patrick Brady, a man Stone claimed was a member of the Provisional IRA. According to the Conflict Archive on the Internet, although Brady was a member of Sinn Féin, he was not in the IRA. This was followed in 1985 by an attempt to kill another Sinn Féin activist, Robert McAllister, but on this occasion Stone was unsuccessful. He subsequently killed Kevin McPolin in November 1985 and would also face charges for the murder of Dermot Hackett in 1987. Stone would subsequently admit to killing McPolin but has claimed that he did not kill Hackett but confessed to his murder in order that a young UFF member might escape punishment. Both McPolin and Hackett were uninvolved Catholics. Stone attacked the people attending the funeral which was being held at the Milltown Cemetery for the three IRA members killed 10 days earlier in Gibraltar by the Special Air Service (SAS) in what was termed Operation Flavius. As Danny McCann, Seán Savage, and Mairéad Farrell were being buried, Stone launched a commando-style assault against the mourners with RGD-5 grenades and an semi-automatic pistol. He killed three people, including IRA member Kevin Brady, and injured sixty others. Stone was eventually overpowered by infuriated mourners and was then arrested by members of the Royal Ulster Constabulary (RUC). He still walks with a slight limp as a result of the dislocated thigh bone he received in the aftermath of the attack. According to Ulster Defence Association (UDA) member Sammy Duddy, two UDA “brigadiers” from two Belfast battalions, fearing IRA reprisals against themselves or the areas they controlled, telephoned the IRA after the Milltown attack, denying knowledge of Stone or his intentions. The two brigadiers both claimed that Stone was a “rogue loyalist” acting without UDA sanction or authorisation. Duddy, however, described Stone as “one of the UDA’s best operators”. Stone, who apparently objected to the newspapers’ portrayal of him as a mad Rambo-style gunman, also confessed to shooting dead three other Catholics between 1984 and 1987. He claimed the victims were linked to the IRA, although it appears that they were unaligned civilians. At his trial he pleaded not guilty, but refused to offer any defence. Convicted of six murders, he was sentenced to life imprisonment with sentences totalling 684 years, with a recommendation he serve at least thirty years. While in HM Prison Maze, Stone became one of the five leaders of the Ulster Defence Association/”Ulster Freedom Fighters” prisoners. Alongside the other four, he met Mo Mowlam during the 1998 negotiations between the government and paramilitaries as part of the peace process. The goal was to get the paramilitaries to come to the negotiation table. He also collaborated with Martin Dillon on a book about his life entitled Stone Cold. On 24 July 2000, Stone was released from prison after 13 years under the Good Friday Peace Agreement. Stone had been living in East Belfast, London and Spain with his girlfriend Suzanne Cooper until the events of 24 November 2006. In 2001 Stone and Ms Cooper exchanged bullet-proof jackets as Christmas gifts. Stone has nine children from his first two marriages. Since leaving prison Stone concentrated on work in the community and being an artist, a hobby he began in the Maze. His paintings are vivid and not so much political as topical. They fetch between a few hundred and a few thousand pounds each. Stone published his autobiography titled None Shall Divide Us, in which he claimed that he had received “specialist assistance” from RUC operatives in carrying out the cemetery killings. A second book and the auctioning of the jacket he wore at the Milltown Cemetery at a Scottish loyalist club for £10,000 have brought forward legislation to ban former convicted paramilitaries released through the Northern Ireland Peace Process from profiting from their crimes. In March 2002 it was reported in the Sunday Life that Stone and Cooper had fled Northern Ireland for France following death threats from loyalists opposed to the peace process. The aim of those behind the threats – reported as being from the Orange Volunteers – was the eventual destruction of the Good Friday Agreement and the end of Northern Ireland’s troubled peace process. Following time in Birmingham, Stone returned to East Belfast. Stone was featured in the BBC2 television series Facing the Truth mediated by Archbishop Desmond Tutu where he met relatives of a victim of loyalist violence. Sylvia Hackett talked with Stone, who was convicted of murdering her husband Dermot, a Catholic delivery man. Although he previously admitted to the murder, Stone told his victim’s widow that he had no direct responsibility, having been withdrawn after planning the attack. At the end of their meeting she forced herself to walk over to Stone and shake his hand – when he placed a second hand on hers, she recoiled and fled from the room. In November 2006, he claimed that in the 1980s he had been “three days” away from killing the then leader of the Greater London Council and former Mayor of London, Ken Livingstone, over his invitations to Sinn Féin‘s Gerry Adams and Martin McGuinness to visit him in London. The plot was reportedly cancelled over fears it had been infiltrated by Special Branch detectives. On 24 November 2006, at 11.16 am, Stone was arrested for attempting to enter the parliament buildings at Stormont armed with an imitation Beretta 92FS pistol, a knife and a “viable” bomb, after placing 8 “pipe bombs” within the grounds of Stormont. Three civilian security guards disarmed him as he entered the building, by trapping him within the revolving doors of the main lobby entrance. The security guards were injured during the struggle with Stone. Following the security breach, the building was evacuated and an Army Bomb Disposal Unit was called to examine the suspect device. Before entering the building he had scrawled an incomplete graffiti stating “Sinn Féin IRA mur[derers]” on the Parliament building. Later examination from the bomb squad revealed that the bag Stone had been carrying contained between six and eight viable explosive devices. Sir Hugh Orde, the Chief Constable of the Police Service of Northern Ireland, said “their potential for death, destruction and injury is being assessed” but added they were “fairly amateurish”. As a result of Stone’s actions, talks between political parties about power sharing and the election of a First Minister, which had only just resumed, had to be abandoned. On 19 December 2006, Stone’s defence lawyer, Arthur Harvey, QC, claimed that the Stormont incident was not intended to endanger the life of anyone. “It was, in fact, a piece of performance art replicating a terrorist attack”, claimed Harvey. During his trial in September 2008, on 13 charges including the attempted murder of Gerry Adams and Martin McGuinness, Stone repeated that his actions were “an act of performance art“. The then Secretary of State for Northern Ireland (Peter Hain) indicated that Stone’s licence for release under the “Good Friday Agreement” would be revoked, and the full 638-year sentence for triple murder, terrorist charges and firearm charges be reimposed on him, in line with his sentencing in 1988. On 25 November 2006, Stone appeared in court in Belfast charged with attempting to murder Sinn Féin leaders Gerry Adams and Martin McGuinness. Stone faced a total of five charges of attempted murder following the incident at Stormont. Stone was charged with possession of articles for terrorist purposes, possession of an imitation firearm in a public place, assault, grievous bodily harm, possession of an offensive weapon and possession of explosives. The court heard the articles allegedly for terrorist purposes included nailbombs, an axe and a garrotte. He was remanded in custody until 22 December 2006. A letter written by Stone was published in the Belfast Telegraph on 29 November 2006. In the letter dated 24 November 2006, Stone described his “mission to Kill” Adams and McGuinness in detail, giving a description of his intended movements once inside the building. On 14 November he was found guilty of attempting to murder Adams and McGuinness. The judge said defence evidence that Stone had been taking part in some sort of a “comic parody” was “hopelessly unconvincing” and “self-contradictory”. On 8 December 2008, Stone received a 16-year sentence for his actions at Stormont. Stone married Marlene Leckey in 1976 and had three sons with her. The couple separated in 1978 and divorced in 1983. At the time of his divorce Stone was cohabiting with Leigh-Ann Shaw. Stone and Shaw were subsequently married in 1985. Although the marriage produced two children, it also ended in divorce. The Milltown Cemetery attack (also known as the Milltown Cemetery killings or Milltown Massacre) took place on 16 March 1988 in Belfast‘s Milltown Cemetery. During the funeral of three Provisional IRA volunteers killed in Gibraltar, an Ulster Defence Association (UDA) volunteer, Michael Stone, attacked the mourners with hand grenades and pistols. As Stone then ran towards the nearby motorway, a large crowd began chasing him and he continued shooting and throwing grenades. Some of them caught him and began beating him, but he was rescued by the police and arrested. Three people had been killed and more than 60 wounded. The “unprecedented, one-man attack” was filmed by television news crews and caused shock around the world. On 6 March 1988, Provisional IRA members Daniel McCann, Seán Savage and Mairéad Farrell were shot dead by the SAS in Gibraltar. This caused outrage among Irish republicans and their supporters as the three were unarmed and allegedly shot without warning. They were due to be buried in the republican plot at Milltown Cemetery on 16 March. For years, republicans had complained about heavy-handed policing of IRA funerals, which had led to violence. In a change from normal procedure, the British Army and Royal Ulster Constabulary (RUC) decided they would pull back from the funerals of the “Gibraltar Three” and keep watch from the sidelines. This followed negotiations with Catholic church leaders. Michael Stone’s self-professed mission was “to take out the Sinn Féin and IRA leadership at the graveside”. He told journalist Peter Taylor that his attack was retaliation for the IRA’s Remembrance Day bombing four months earlier. Taylor wrote, “He said it was symbolic: the IRA had attacked a British cenotaph and he was taking revenge by attacking the IRA equivalent”. Stone claimed a “senior member of the UDA” had given him the organisation’s “official” clearance for the attack and claimed he was given a Browning Hi-Power 9mm pistol, a Ruger .357 Magnum revolver and seven RGD-5 grenades the night before the funeral. The funeral service and requiem mass went ahead as planned, and the cortege made its way to Milltown Cemetery, off the Falls Road. Present were thousands of mourners and top members of the IRA and Sinn Féin, including Sinn Féin’s Gerry Adams and Martin McGuinness. Two RUC helicopters hovered overhead. Stone claimed that he entered the graveyard through the front gate with the mourners. Some eyewitnesses claimed to have seen Stone enter the graveyard from the M1 motorway with three other people (two men and a woman). The others walked across the graveyard and later left on the Falls Road side. As the third coffin was about to be lowered into the ground, Stone threw two grenades—which had a seven-second delay—toward the republican plot and began shooting. The first grenade exploded near the crowd and about 20 yards (18 m) from the grave. Amid the panic and confusion, people took cover behind gravestones. Stone began jogging toward the motorway, several hundred yards away, chased by dozens of men and youths. He continued shooting and throwing grenades at his pursuers. Three people were killed while pursuing Stone: two Catholic civilians Thomas McErlean (20) and John Murray (26), and a Provisional IRA volunteer, Caoimhín Mac Brádaigh (30). During the attack about 60 people were wounded by bullets, grenade shrapnel and fragments of marble and stone from gravestones. Among those wounded was a pregnant mother of four, a 72-year-old grandmother and a ten-year-old boy. In the 19 March edition of the Irish Times, columnist Kevin Myers, an opponent of republican paramilitary violence, wrote: “Unarmed young men charged against the man hurling grenades and firing an automatic pistol […] The young men stalking their quarry repeatedly came under fire; they were repeatedly bombed; they repeatedly advanced. Indeed this was not simply bravery; this was a heroism which in other circumstances, I have no doubt, would have won the highest military decorations”. A white van that had been parked by the motorway suddenly drove off as Stone fled from the angry crowd. The RUC said the van was part of an uninvolved police patrol. Stone later claimed that a getaway vehicle, driven by a UDA member, was waiting for him on the motorway but the driver “panicked” and left. By the time Stone reached the motorway, he had seemingly ran out of ammunition. He ran out onto the road and tried to stop cars, but was caught by the crowd and beaten unconscious. RUC officers quickly arrived, “almost certainly saving his life”. They arrested him and took him to Musgrave Park Hospital for treatment of his injuries. The whole event had been recorded by television news cameras. That evening, angry youths in republican districts burnt hijacked vehicles and attacked the RUC. Immediately after the attack, the two main loyalist paramilitaries—the UDA and the Ulster Volunteer Force (UVF)—denied responsibility. The leader of the UDA’s West Belfast Brigade, Tommy Lyttle, said that Stone was a rogue loyalist acting without orders from the UDA, though he did not condemn the attack. Lyttle told other UDA leaders to keep to this line. UDA member Sammy Duddy said: “After Milltown, two UDA brigadiers from two Belfast battalions telephoned the IRA to say they didn’t know Michael Stone […] But Michael was UDA, he was a travelling gunman who went after the IRA and Republicans and he needed no authority for that because that was his job. Those two brigadiers were scared in case the IRA would retaliate against them […] so they disclaimed Michael, one of our best operators”. Sinn Féin and others “claimed that there must have been collusion with the security forces, because only a small number of people knew in advance of the reduced police presence at the funerals”. Stone later claimed he had assurances that British soldiers and RUC officers would not be deployed in the graveyard. He also claimed to have had detailed information about British Army and RUC movements. Stone wrote that, the night before the attack, he was “given his pick of weapons from an Ulster Resistance cache at a secret location outside Belfast” and was “driven back into the city by a member of the RUC”. According to journalist Martin Dillon, the weapons he used were given to him on the orders of UDA intelligence chief Brian Nelson, who was later revealed to be an undercover agent of the British Army’s Force Research Unit (FRU). Three days after the Milltown killings, one of Stone’s victims, Caoimhín Mac Brádaigh, was being buried when two plain-clothes British Army Corporals (Derek Wood and David Howes) in an unmarked car drove into the path of the funeral cortège – apparently by mistake. Some of those present, believing the soldiers to be loyalist gunmen, surrounded and attacked their car. Corporal Wood drew his service pistol and fired a shot in the air. The two men were then dragged from the car before being taken away, beaten and shot dead by republicans. The incident is often referred to as the corporals killings and, like the attack at Milltown, much of it was filmed by television news cameras. The Browning pistol Stone used during the killings was stolen by the mob on the day of the attack and was eventually used by an IRA unit to ambush a combined RUC/British Army patrol in Belfast on 13 October 1990. A constable was shot dead and another badly injured.